When using the term "pop-punk" to describe a band, there is a fine line that must be walked. If the music leans too far either way, it takes on a completely different meaning. 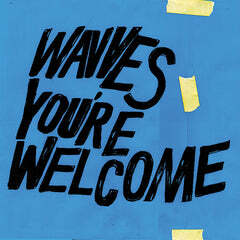 Wavves' sixth album You're Welcome toes the line as a well-crafted and enjoyable collection of infectious songs. While the songs on the album are not necessarily linked in any discernible thematic sense, they are presented with similarity: finely alternating between dynamic highs and lows. Many of the tracks feature fairly repetitive lyrics with catchy melodies that make the songs easy to learn and fun to sing along with. Lead track "Daisy" starts strong with a solo guitar riff, quickly joined by the whole band. The song speaks of getting away to be with a love, while dodging obstacles along the way. Title track "You're Welcome" begins monotone with a low-key melody then proclaims, "You ain't gotta mention it, ain't gotta mention it. You're welcome." The beauty is in the layered simplicity of not knowing why Wavves frontman Nathan Williams was being thanked and making a 3-minute song of saying you're welcome to someone. As the album continues, Wavves pay homage to rock music throughout the ages. "Come to the Valley" is a throwback to '60s surf rock by trying to entice everyone to come to a better life - living without a care and bathing in the sun. "I Love You" is a fitting tribute to '50s ballads using classic blues riffs while singing of unrequited love. This is not to say the album lacks any sort of modernity. "Million Enemies" makes use of a driving drum beat to power the song, while boasting a steady bassline behind powerful lyrics declaring freedom of mind from naysayers. "Under" starts with harmonious vocals over a synth, abruptly erupting into the chorus of, "You take me under." Clocking in at 36 minutes, You're Welcome offers more than meets the eye.